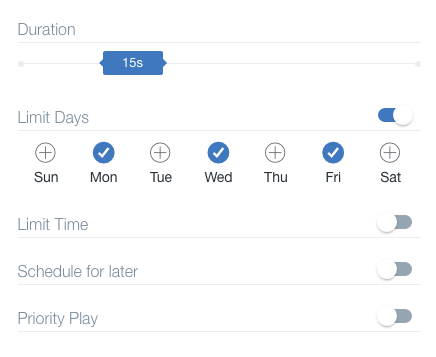 Our Graphics app now offers more detailed scheduling options. Use the Duration slider to set the amount of time you'd like your graphic to show on the screen. If it's a picture graphic with not much content, you can set it to a shorter amount of time so your customers will get a brief glimpse. If it's a more detailed event announcement, set it to up to 60 seconds so they can get a good long look at the graphic content. Please note: Duration settings won't affect videos. Videos play their full length regardless of the duration setting. This option is perfect for promotions or events. Have a weekly meeting that you'll be advertising via the Graphics app? 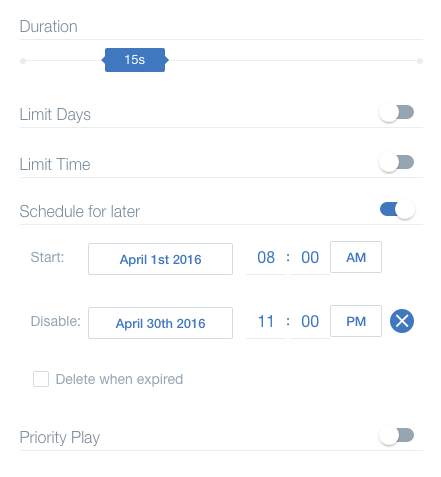 Switch on the Limit Days toggle, then check off which days you'd like the graphic to play. Alternately, if you have a daily lunch special, switch on the Limit Time toggle, then set the time you'd like that specific graphic to play every day. Have a happy hour several days a week that you'd like to advertise? Combine these two options to show the graphic only on the days and times you'll have the deal available. Don't want to play a graphic right now, but want to set it up to play in the future? 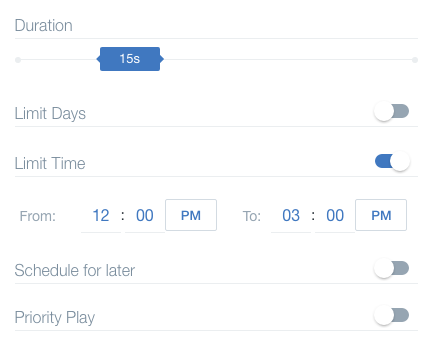 Enable the Schedule for Later toggle, then select the date you'd like the graphic to begin playing. This option is perfect for scheduling graphics for an event weeks ahead of time, so that when the event rolls around, you don't have to worry about uploading the graphic - it will already be in the system, and begin playing on the selected date. If you'd like the graphic to stop playing on a certain date, you can use the Disable option. For example, if you have a springtime lunch special that will run through April, but end April 31st, this option is ideal. On the selected Disable date, the graphic will be "disabled" - it will be removed from the selected display group(s), although it will still be available in your "All Graphics" library. If you'd like the graphic to be completely deleted on the Disable date, use the Delete when expired checkbox. You can set your graphic to show up more often on your display. The lower the number you set, the more frequently that graphic will play on repeat. 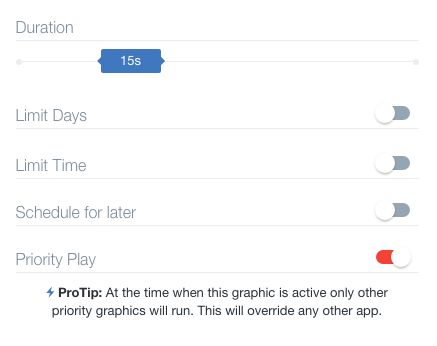 Our Priority Play option allows for one or more graphics to take on a "priority" feature, where they will take priority over all other graphics and apps scheduled to play on the screen. Enabling the Priority Play toggle for a graphic will cause the screen to play only that graphic. No other apps will play during that time. We strongly suggest limiting the days & times this graphic will play. Please note - if you make any changes to the Graphics app or to the priority play graphic while Priority Play is on, it will temporarily take the Graphics app off the screen while the device reloads the Graphics data.